Today I needed to move 435 TIFF images from the San Marcos Daily Record Negative Collection into folders based on a section of their filename. If there is more than 1 negative in folder 185, then the 2nd image will get index number 002, i.e. SMDR_1959-185_002.tif. 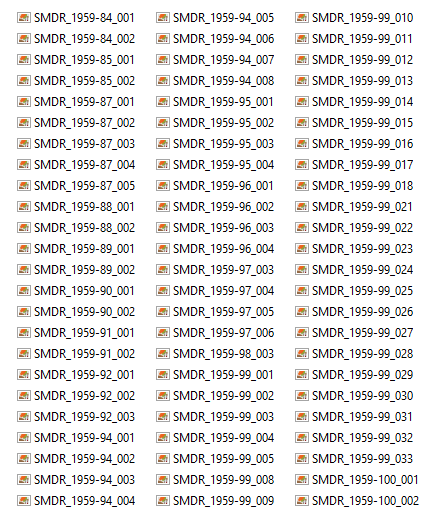 We organize the images in digital folders to match the physical folders, so every image in the SMDR collection from 1959 in physical folder 185 needs to be in a digital folder 185. The folder therefore only needs sections 1-3 of the filename, i.e. SMDR_1959-185. I have the images and I know what my digital folder names need to be, but if I did all of this work by hand it would not only take a significant amount of time, I would probably make a few mistakes. This type of repetitive work is better handled by the computer because it will not only create the folders and move the files more quickly, it is much less likely to make mistakes (assuming I provide the proper instructions). This code doesn’t use best practices as I should be creating the directory path differently, but hey, it worked and I was able to create the directories, move the files, and write this blog post in significantly less time than it would have taken to do it manually. This entry was posted in Code and tagged by Jeremy Moore, Code, Python by Jeremy Moore. Bookmark the permalink.